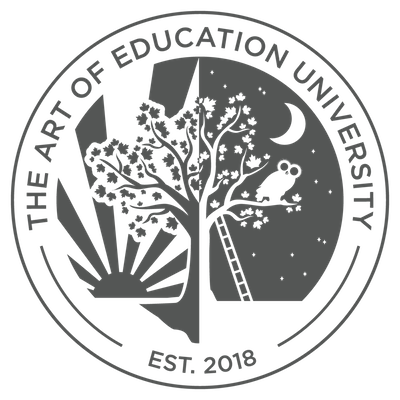 The official seal of The Art of Education University (AOEU) showcases the institution’s core values and principles. The seal represents values like lifelong learning, personal growth, and AOEU’s unique “University for Life” learning model. Sun and Moon: The sun and moon represent an art teacher’s full life of learning. AOEU serves its students from the beginning of their careers (sunrise), until retirement (nightfall). Tree of Personal Growth: The tree represents an art teacher’s personal growth and expanding knowledge. The tree is a maple, which is a subtle nod to Osage, Iowa, the small, unassuming town AOEU calls home. Ladder of Lifelong Learning: Each rung on the ladder represents a unique type to learning. While most institutions focus on only a few rungs (degree programs), AOEU believes each rung (degrees, courses, media, events, etc.) plays an essential role in personal growth. Owl of Athena: Buried amongst the rubble of the Athenian Parthenon, the Owl of Athena is a symbol knowledge and wisdom. Inscribed beside the owl were the letters “AOE” (alpha, theta, epsilon) meaning “Of the Athenians” in ancient Greek.